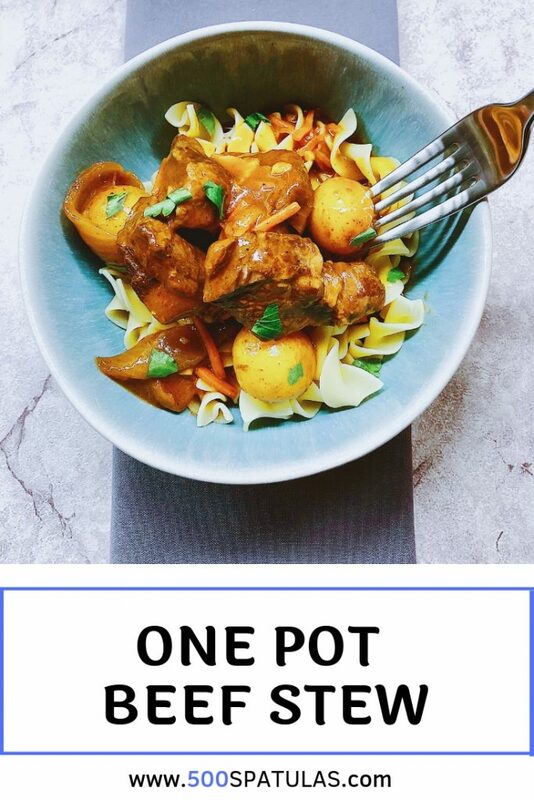 Spring is finally here and somehow I never shared my One Pot Beef Stew recipe 🤦‍♀️ For the next few weeks of chilly nights, warm up with the delightful little number. 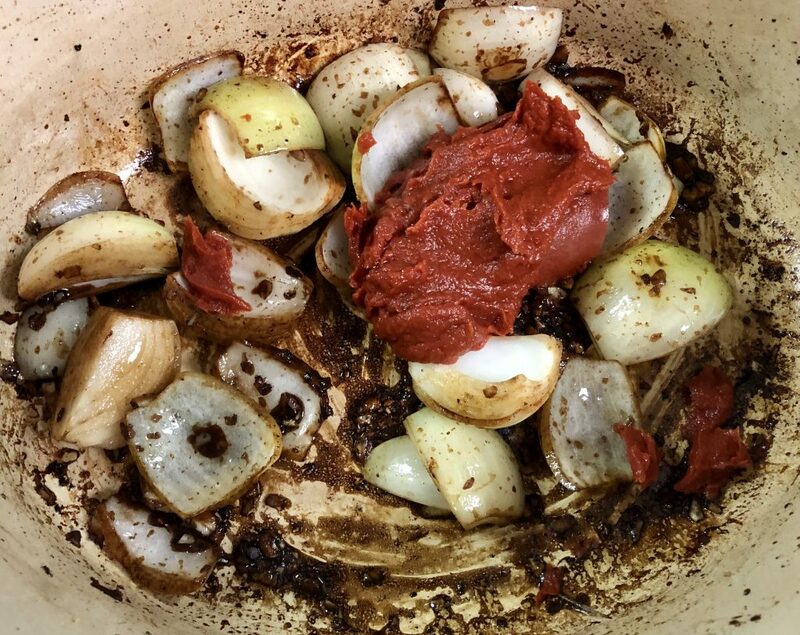 Rich developed flavor, and all in one pot! What could be better? There is an overnight rest for this recipe, but it’s so worth it. Enjoy it! Preheat oven to 325 degrees. Pat the meat dry and season with salt and pepper. 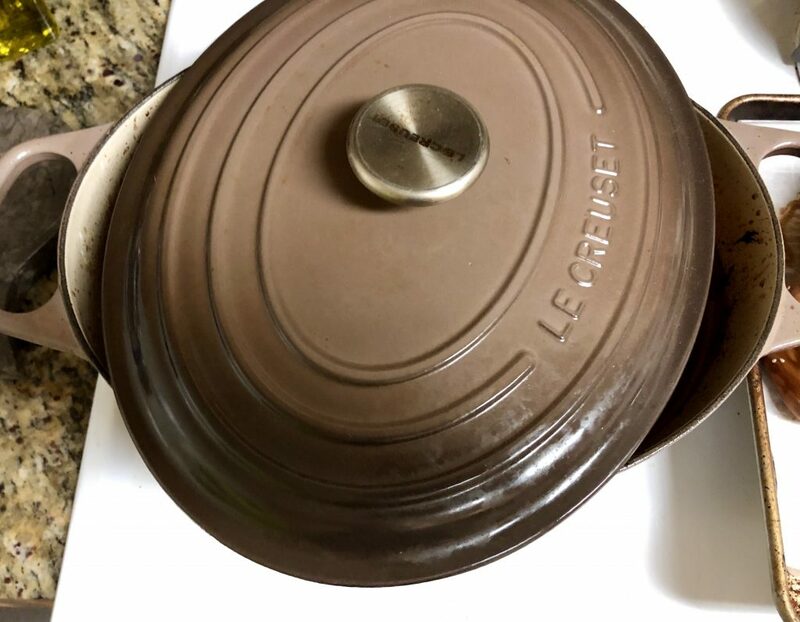 In a large dutch oven or stove/oven safe pot heat 1 tbsp of oil over med-high heat. Brown the meat in 3 batches (adding 1 more tbsp of oil before the next batch) for 2 1/2 minutes on the top and 2 1/2 minutes on the bottom (use tongs to flip). 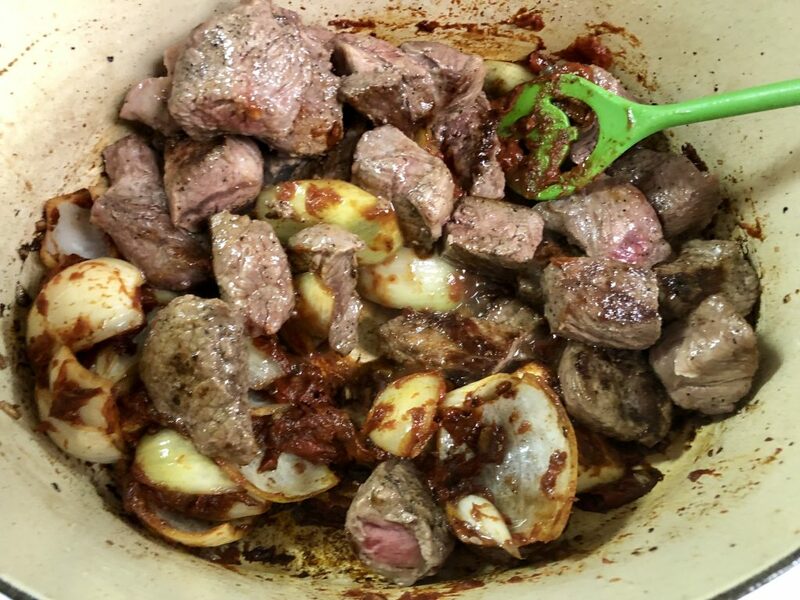 If you crowd the meat it won’t brown as well. 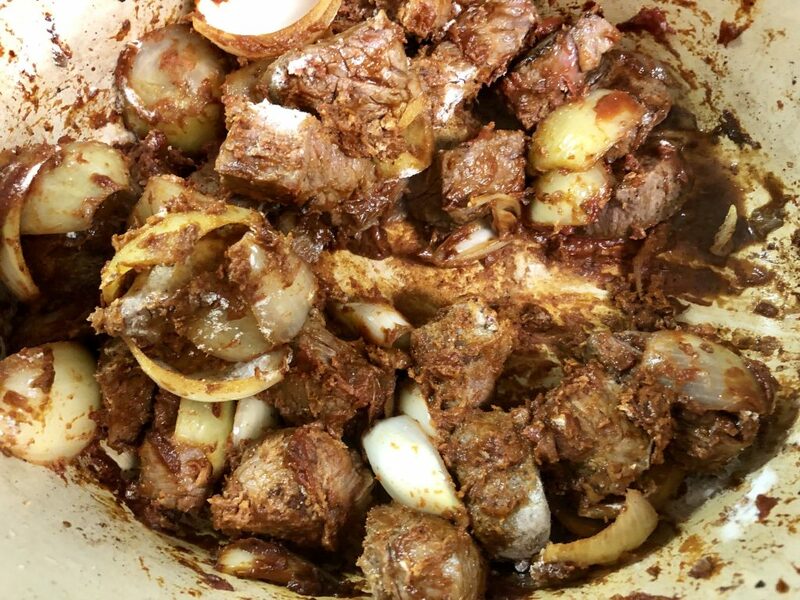 As each batch finishes, transfer the browned meat into a large bowl. Set aside. 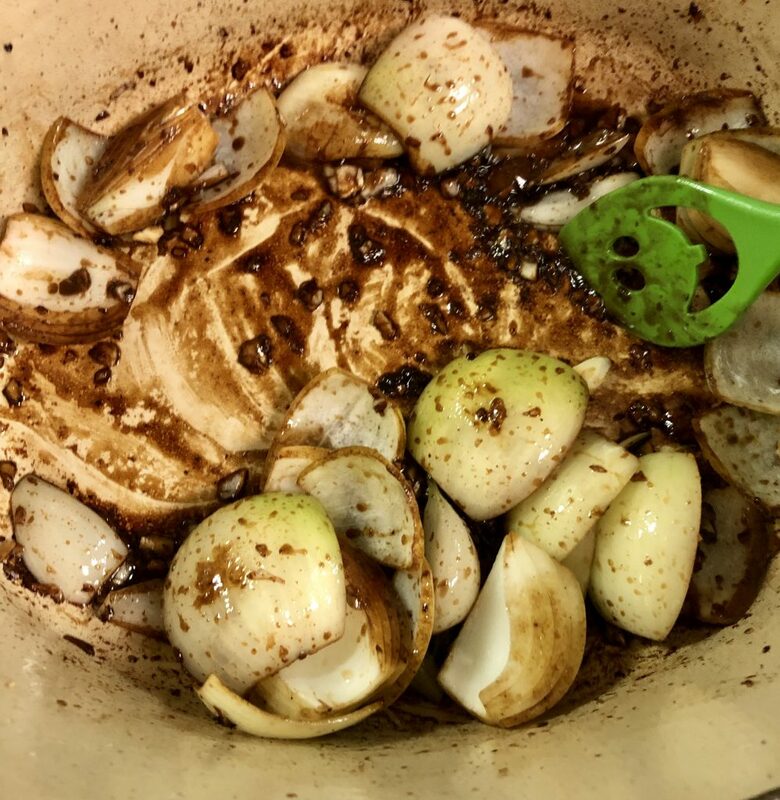 Add the onions, garlic, and balsamic vinegar to the pan and use a wooden spoon to scrape up the brown bits from the bottom of the pan. 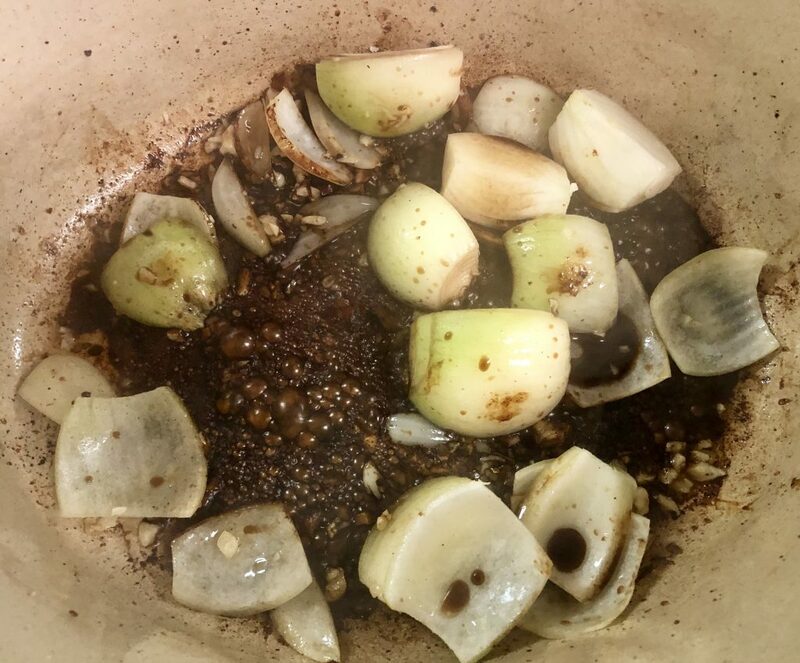 In this step, we’re deglazing the pan with the balsamic vinegar and getting all those flavor bits into the recipe. Cook for 3 minutes. Add the tomato paste and cook for another minute. Add back in the beef with all of the juices in the bowl and the flour. Stir until the flour is dissolved and then add the remaining ingredients (besides the parsley). Stir to incorporate and cover the pot with a lid or tight aluminum foil and move to the oven to cook for 3 hours. After the 3 hours, remove the pot from the oven and let it come to room temperature. Refrigerate overnight. 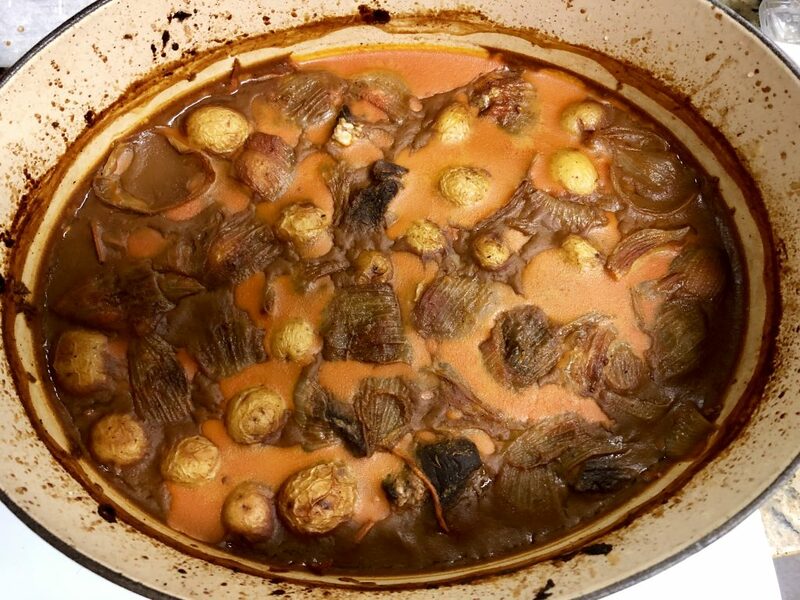 The next day, remove the pot from the refrigerator and use a spoon to remove any fat solids from the surface of the stew. 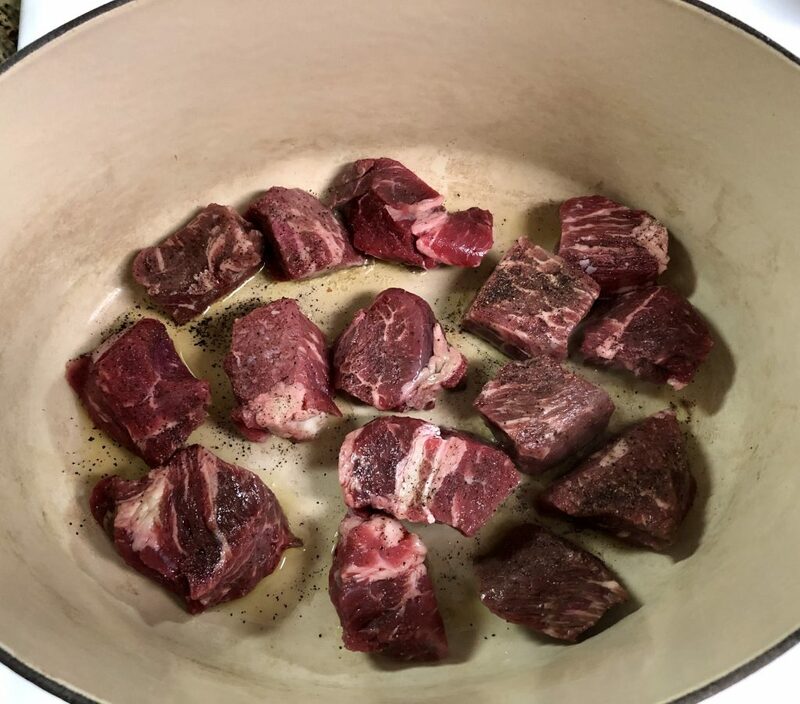 I like to keep these in the freezer for future recipes (latkes, matzah balls etc), but fair warning, beef fat is orange and may add a bit of color to whatever it’s added to 🙂 Reheat, covered, at 350 degrees for 45 minutes – 1 hour until hot. 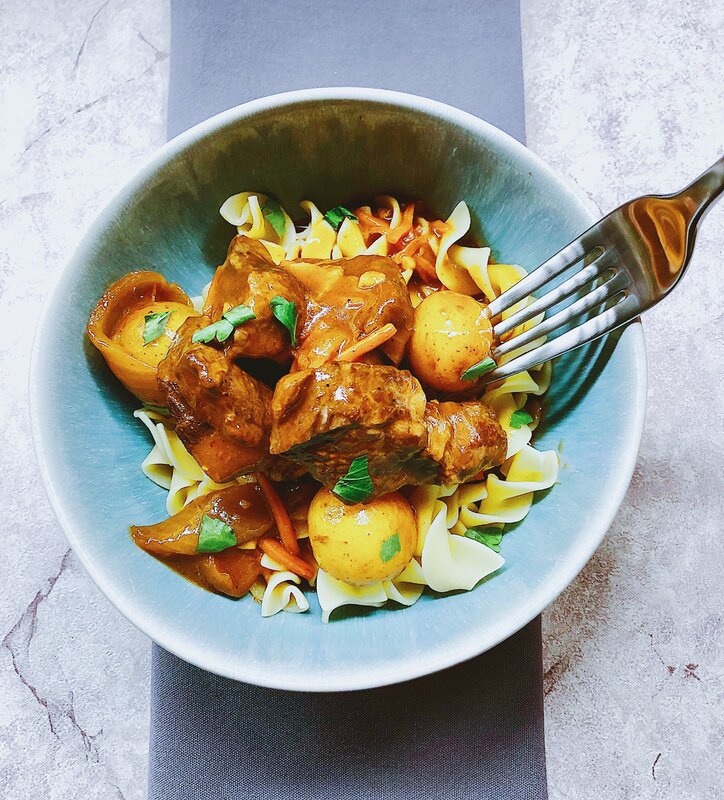 Garnish this One Pot Beef Stew with fresh chopped parsley and serve as desired–I like to serve this over egg noodles! 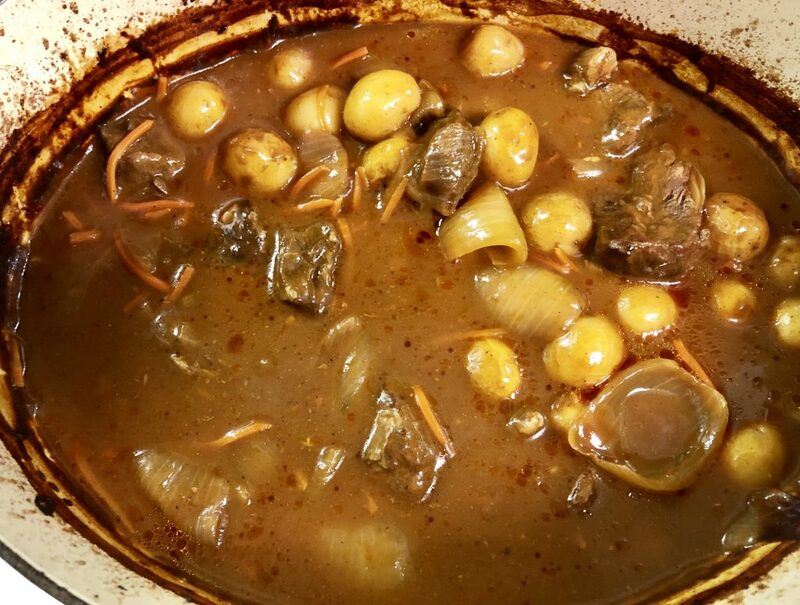 The next day, remove the pot from the refrigerator and use a spoon to remove any fat solids from the surface of the stew. 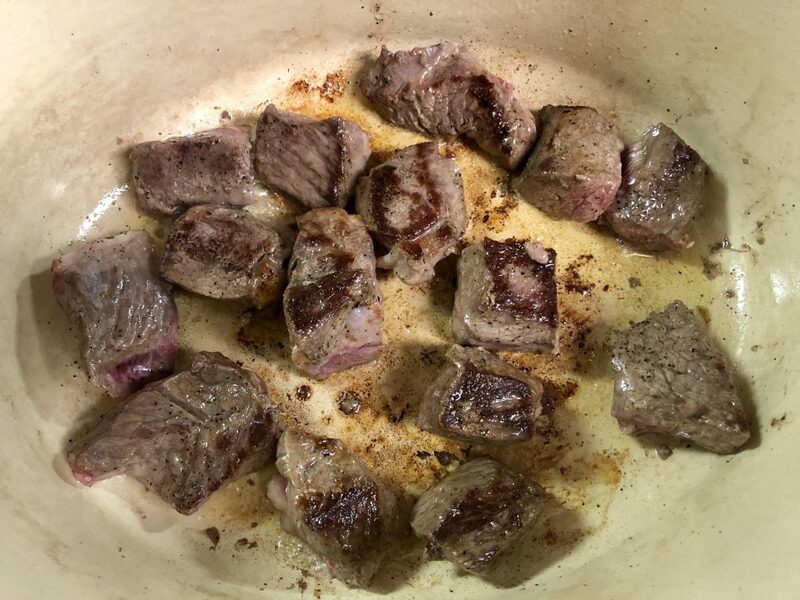 I like to keep these in the freezer for future recipes (latkes, matzah balls etc), but fair warning, beef fat is orange and may add a bit of color to whatever it’s added to 🙂 Reheat, covered, at 350 degrees for 45 minutes – 1 hour until hot. Garnish with fresh chopped parsley and serve as desired–I like to serve this over egg noodles! 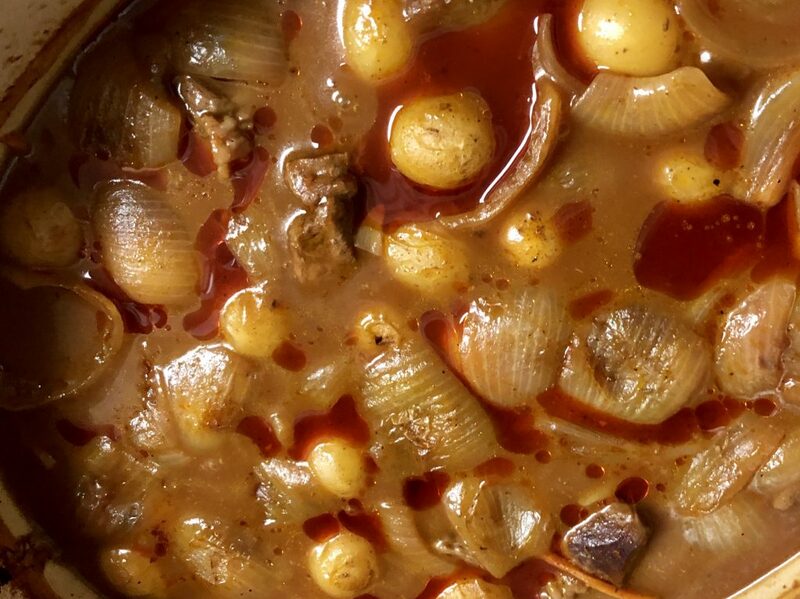 This recipe has an overnight rest after cooking. Wow! That looks delicious! 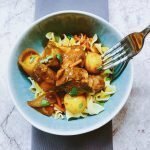 beef stew and other dishes that have high fat and protein content are always better after the acids in them have had a chance to break down. 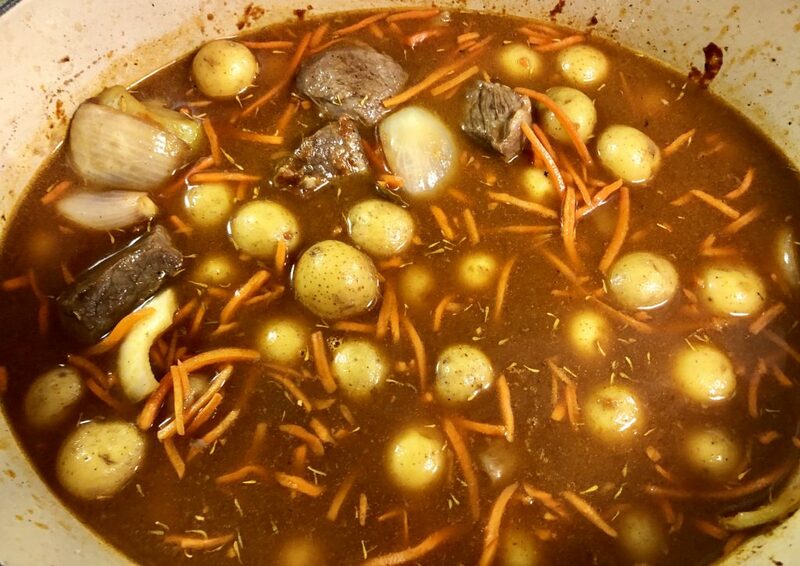 Now I really want to make some beef stew! 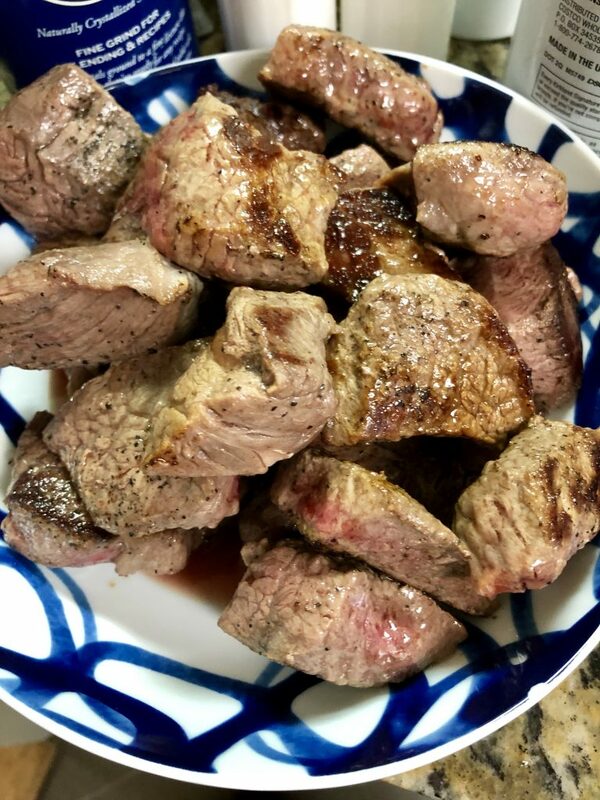 🙂 I always think “low and slow” beef recipes are the best!